Remedy Skin Repair Cream uses water molecules to not only moisturize the skin but also deliver the nutrients of Olivamine (amino acids, antioxidants, vitamins, MSM) to the cells. Once absorbed, the natural oils (olive and canola) and essential fatty acids (oleic and linoleic) aid the skin repair process. While all Remedy products contain Olivamine, Skin Repair Cream contains twice the amount of any other product. 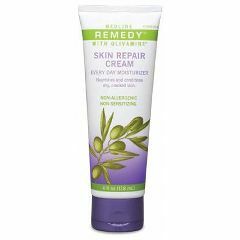 Remedy Skin Repair Cream is specially formulated for patients who are at-risk for skin breakdown. Helps block e-TEWL. It also provides relief to skin affected by dryness. Helps protect and relieve damage related to frequent handwashing such as dryness, cracked, inflamed, reddened and itchy skin. Ideal as a facial moisturizer and even as a treatment for dry hands. Unlike other moisturizers, Remedy Skin Repair Cream will not interfere with the antimicrobial properties of CHG (Chlorhexidine Gluconate). It can be used before or after washing with CHG products. Additionally, it does not interfere with or degrade latex. Safe. Lightweight. Easy Storage. Effective. Easy To Use. Good Smell. Non-Greasy. Inexpensive. Sturdy. Easy to apply . Elderly. Diabetic. Infections damaged skin. Poor Health. I use the product on my mother's hips daily. In the past mother had a wound on her her hip. This product is good for repairing her skin following the wound healing. A cream that does what it claims to do. Non-Greasy. Easy To Use. Good Smell. Effective. Easy Storage. Elderly. Everyday. Women. Following Surgery. Elderly. Diabetic. Extremely sensitive skin. Extremely damaged skin. Dry/Cracked Skin. average health>50 . This product helps heal my lymphadema. It's a great relief to have something to help heal the sore crscked dry skin. Top notch lotion. Will buy again! Effective. Easy To Use. Good Smell. Inexpensive. Non-Greasy. It cures the driest of skin and eases the pain from red and cracked skin. Best lotion ever! Safe. Easy Storage. Effective. Easy To Use. Good Smell. Non-Greasy. Elderly. Extremely sensitive skin. Excellent Health. Quality Oriented. This product really improves my hands; particularly good in winter, when I tend to have hangnails and dryness. Yes! I actually put some on my face today. Love it. It is a every day moisturizer so yeah it should be great for the face, hands,and feet.